While some worrisome spy photos surfaced last week showing Johnny Depp in heavy white make-up, big sunglasses and period clothing for his turn in Tim Burton's big screen adaptation of Dark Shadows, the 1960's gothic daytime serial with vampires, ghosts, ghouls, zombies, werewolves, parallel universes and time-paradoxes. Now in a bit of damage control, the first official image from the film has surfaced featuring Depp, Helena Bonham Carter, Michelle Pfeiffer and the rest of the cast looking like a new version of The Munsters or The Addams Family, but with a little less darkness. See the photo below! With this photo, Burton said he wanted to recapture a very specific image in his mind from the original series: "I remember seeing a group photograph of the cast of the original series. 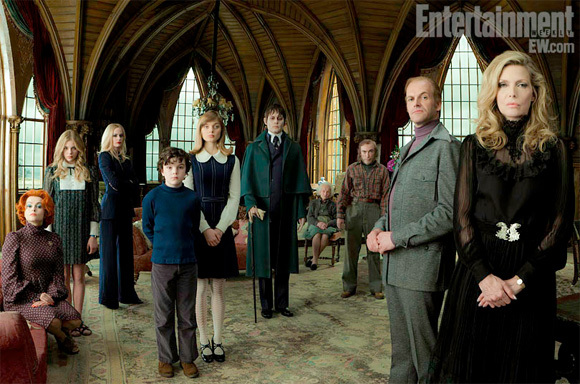 For me it captured the weird Dark Shadows vibe in a single image. I had a brief window of opportunity to have our cast present at the same time, the day before principle photography began. We decided to stage a similar picture instead of rehearsing, to see if we captured the Dark Shadows feeling.” If you're unfamiliar with the original series and looking for more information on the characters, EW has a great rundown right here. Thoughts? Honestly, with the exception of Big Fish, it's been so long since Burton has made a decent movie, I have next to no interest in anything he's involved with anymore. I agree, but I also really enjoyed Sweeney Todd! And this looks promising... I guess. I'll also agree. I really don't care much about the Burton/Depp combo anymore. Tim Burton is a fantastic director. Though Alice in Wonderland was a misstep, he's a true visionary. This film has a stellar cast but I wish it was for a better project than this. So Bonham Carter is playing The Red Queen again? I guess it's one of them crazy quacks (doctors) that are sometimes in movies. The entire Dark Shadows is available on Netflix instant (is that what its called?) But, lets be honest to all of those forgetting Planet of the Apes to Charlie and the Chocoshitshow—and countless others since Big Fish—that Burton has been off his game for a long, long, long time. This is undeniable such that its amazing he's (allowed and financed to be) making movies still. The only piece of quality cinema he's been attached to in recent years is his wife, though sadly not through any of his own movies. So, while Im interested in this project through my appreciation of the TV show, I do not have high-hopes for this film. I love Michelle Pheiffer. That's pretty much it. I remember there once was a time when Depp's name with Burton meant for very exciting things. I want to like this but I am still unsure from what I have seen so far. I was expecting it to be.. I don't know.. DARK? Still very pumped. Who knows, I'll give it a go. He should have made Monsterpocalypse before this! Dreamworks announced he was doing this but I guess the budget got to be too high...I guess they didn't want it to go head to head with Pacific RIm. AWESOME! Love the photo, director and cast. Good to see Michelle Pfeiffer back. Hope the movie will also be good. Good to see Michelle Pfeiffer going old school and channeling Nancy Sinatra. Almost didn't recognise Jonny Lee Miller and Jackie Earle Haley. I Can't wait for its' release date! Love Johnny Depp. Loved the Black Comedy Willie Wonka movie. Sure to love this. Twighlight will be over so I will chomping at the bit for a new vamp movie. A must see for me since i like vampires.